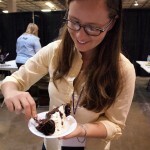 This weekend I volunteered to participate in the annual That Takes the Cake sugar and art show as a judge for the tasting competition. 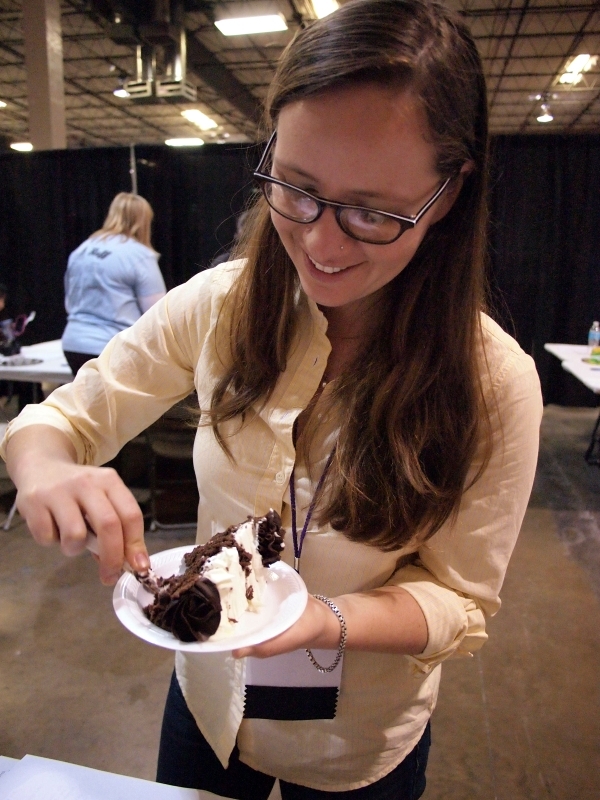 The competition was divided into five categories: angel food cakes, moon pies, candy, cookies, and “mini-bottle cakes.” If you don’t know, and I initially did not, mini-bottle cakes are cakes made with or flavored with alcohol. Obviously, I was most excited to try the 18 entrants in this category. And try I did! The range of styles, flavors, and creativity of these cakes was impressive, which made judging all of these cakes extremely fun and filling work. My three favorite cakes were: 3) a nicely decorated chocolate Guinness cake with Bailey’s icing, 2) a delicious limoncello coffee cake, and (drum roll!) 1) a beautiful White Chocolate Godiva Liqueur layer cake with Chambord icing. The winners from each category were evaluated by all of the judges and the bottle cake winner was bested by a fantastic chocolate raspberry mousse confection. 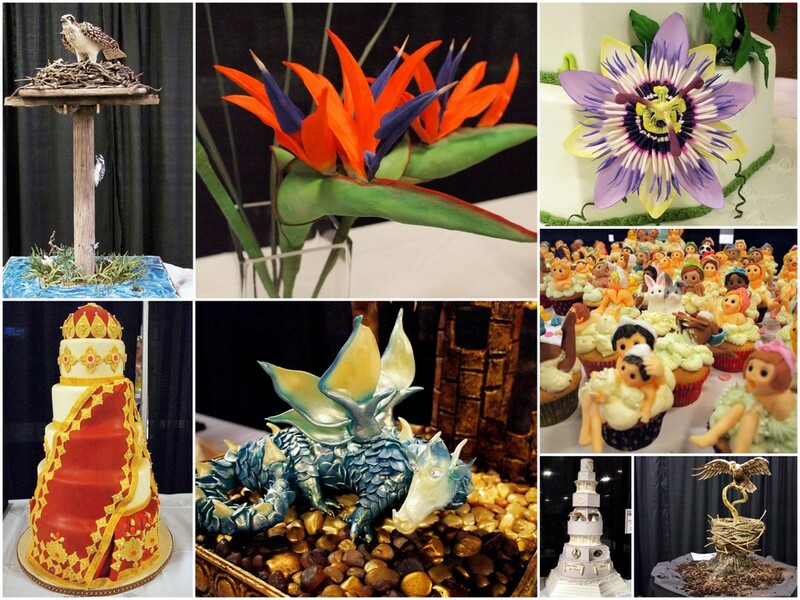 In addition to the tasting competition, That Takes the Cake is also a sugar arts show. This is a whole sub-set of the baking world that I am unfamiliar with but some of the feats of sweets that I witnessed were beyond impressive. That Takes the Cake was a a great demonstration of the creativity and talent that exists in the Austin culinary scene and it made me happy and proud to live here. The show was also quite inspirational. Coseppi Kitchen does not feature a lot of baking, but that is in part due to our focus on healthy and inclusive cooking. But, I like a challenge so when we went to a potluck/coed baby shower on Sunday I brought my newly invented Mini Allspice Dram Cakes with Mayfair Icing. Maybe in 2014, That Takes the Cake will see a Coseppi vegan, gluten-free entry! 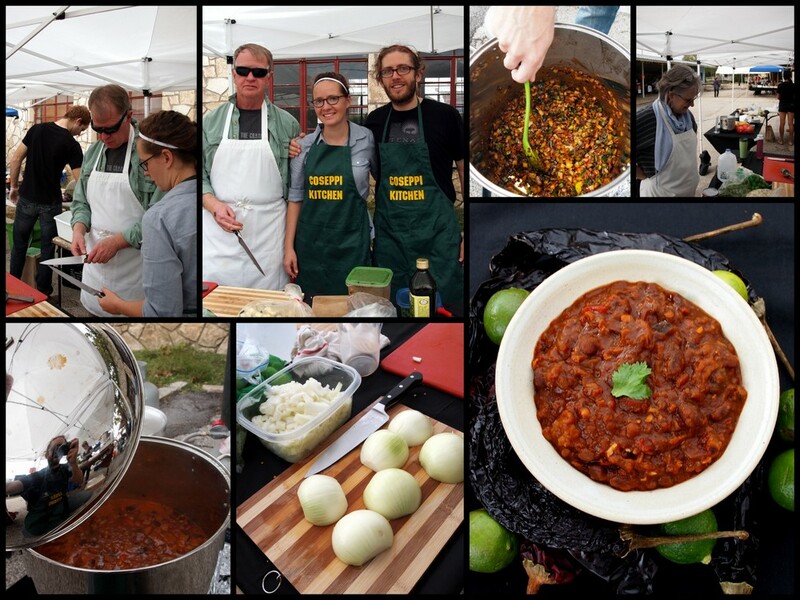 This year, Coseppi Kitchen answered the call to duty when the Austin Food Blogger Alliance (AFBA) asked for volunteers to represent the organization at the 24th Annual Lone Star Vegetarian Chili Cook-Off. 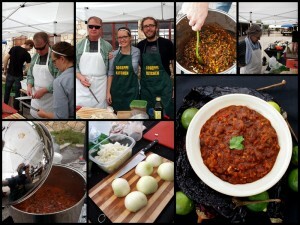 With the help of some AFBA volunteers including Jessica of Bake Me Away (see her write-up here), we made five gallons of Black Bean, Lentil, and Eggplant Chili and served hundreds of Cook-Off attendees! After braving the wind, some knife nicks, and a few steam burns, we went on to win the “All Veg” Category and the greatest honor of all, People’s Choice! Thanks goes out to everyone who helped including Jessica, Gabe Hasser, Taylor’s parents Mike and Shelly who came down from Fort Worth to help, and the folks who lent us the equipment – Stephen Palmer, Clayton Ernst, and Molly Frisinger. We also need to thank Johnson’s Backyard Garden for the delicious eggplant and cilantro that carried us through to victory! Boil the black beans with 2 stemmed chili pasilla peppers, 3 bay leaves, and half of the diced garlic until soft, about 1 1/2 hours. While the beans are cooking, finely dice (or use a food processor) the remaining chiles pasillas, chiles cascabeles, and chipotle peppers. When black beans are tender, remove from heat. Saute the onion, diced dried chilies, and ground cumin in olive oil over medium-high heat until the onions are soft and the cumin is fragrant, about 10 minutes. Add the remaining diced garlic and the diced poblano pepper, and saute for 5 minutes more. Add the eggplant and a pinch of salt, then continue to saute until it is tender, about 8 minutes. Add the crushed tomatoes, diced tomatoes, water, Better-than-Bouillon, and lentils. Bring to boil then lower heat to simmer, stirring occasionally, until the lentils are almost cooked, about 30 minutes. Add the cooked black beans and let the chili simmer until the lentils are soft and the flavors have melded, about 30 minutes more. The longer you let the chili simmer, the thicker it will become, so you can adjust based on your preferences. Season with salt to taste and add the key lime juice. 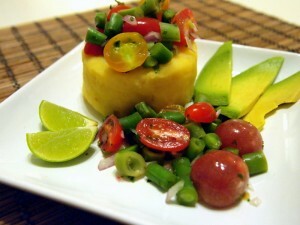 Serve with fresh chopped cilantro, diced jalapenos (for extra heat), or your preferred chili topping. 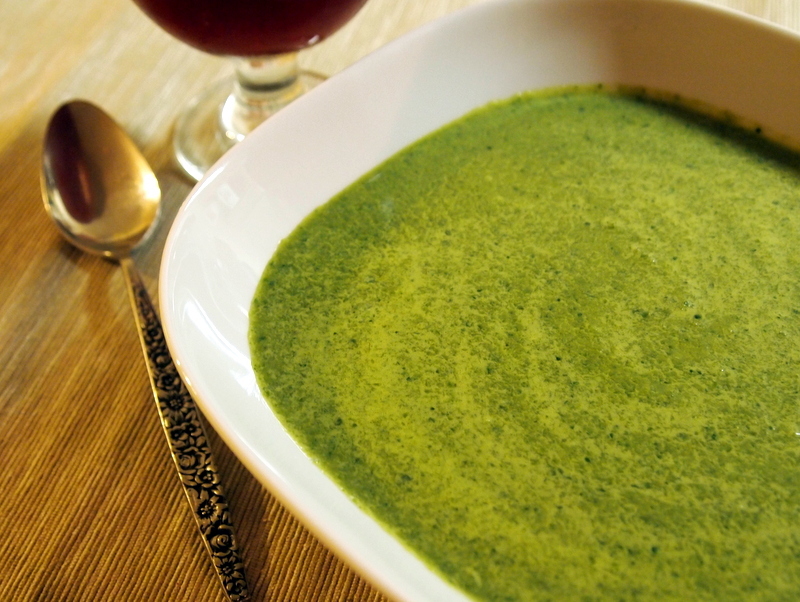 This attractive soup is a great way to get some more super nutritious kale into your diet. The addition of a small amount of sugar helps tone down kale’s natural bitterness. Saute the onion and garlic in olive oil in a large soup pot until the onion just begins to brown. 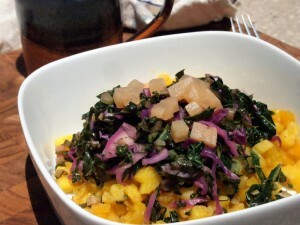 Add the kale and sugar, reduce heat to simmer, and cook until kale is tender, about 5 minutes. Transfer the soup to a large blender, add cream, and process until smooth. Return soup to pot, heat until thoroughly warmed, add a pinch or two of ground nutmeg, season to taste, and serve. Arroz Chaufa is a Peruvian take on Chinese fried rice and is probably one of the most popular dishes in all of Peru. This vegetarian version uses brown rice, seasonal vegetables, and Peruvian herbs to create an authentic and healthful meal. 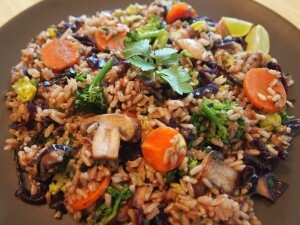 Prepare the rice in a rice cooker or on the stove top as directed. Optional: Whisk the egg vigorously and scramble in a large frying pan or wok with 1 tablespoon of vegetable oil. When the egg is thoroughly cooked remove from the pan and set aside. Add the remaining vegetable oil and sesame oil to the hot pan. Saute the ginger, garlic, green onions, and mushrooms until the spices are softened and aromatic and the mushrooms have expelled their liquid, about 3 minutes. Add the vegetables and saute until the broccoli is bright green and tender, about 3 minutes. Add the cooked rice, soy sauce, and herbs until well heated. Optional: Stir in cooked eggs. Serve hot with your favorite ají (try our Chifa Style Ají).